Many thanks to the global team who helped us to achieve this! 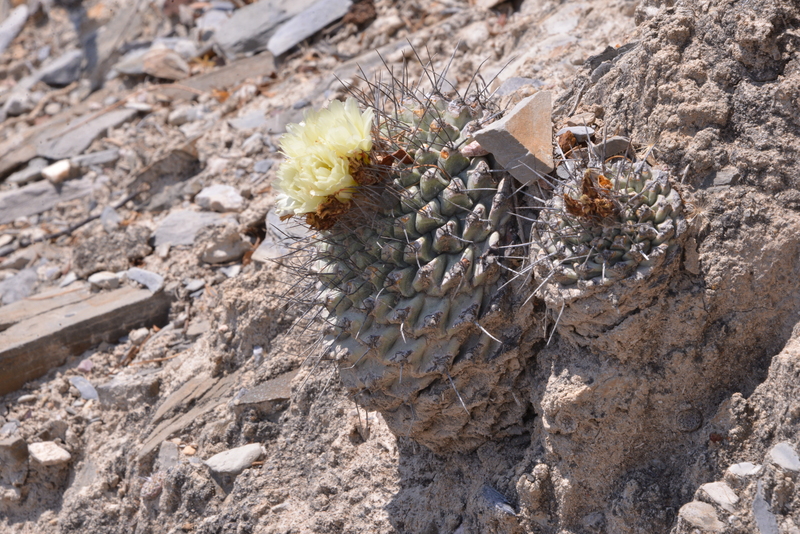 ‘ Strombocactus corregidorae S. Arias et E. Sanchez, from the Infiernillo Canyon, in the Moctezuma River, at the border between the Mexican states of Querétaro and Hidalgo, is described and illustrated. It differs from S. disciformis by its massive body, larger, strong, thick, persistent, black-gray spines, yellow flower, seeds with flat periclinal wall cells, finely reticulate micro-relief, and hilum-micropylar region not covered by a strophiole. 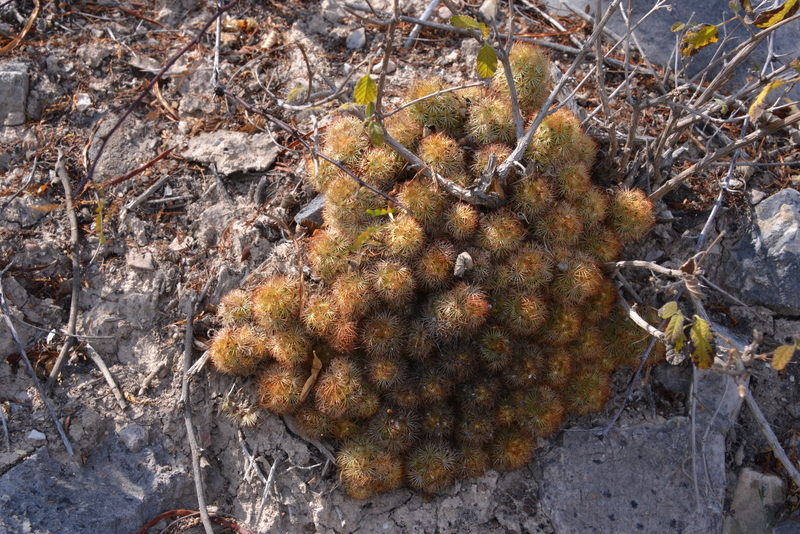 An identification key to Strombocactus species, based on stem, flower, and seed characters is included’. The plants were found on 7 May 2008. To take the picture of the plant in flower I had to shuffle along a very narrow ledge on very unstable slate-like substrate. There was nothing to hold on to, except an Agave with sharp teeth along the leaf’s edges. Not much to prevent you from falling down a 400 m hillside! Cliff and Ian were shouting at me not to be stupid, ‘you’ll kill yourself’ and other kind words of support, while taking pictures of where my remains would rot if a fall had taken place – it did not! At the time of writing I have been unable to find any other images of this taxon in flower in habitat – a small triumph, worth being declared mad over. Other cacti spotted (in safer positions): Agave difformis, Astrophytum ornatum including one plant some 1.5m (5 ft) tall, Bursera morelensis and B. schlechtendalii, Cylindropuntia leptocaulis, Echinocactus platyacanthus, Ferocactus histrix, fouquieria splendens, Hechtia sp, Mammillaria elongata ssp elongata (no central spines), Opuntia microdasys, Opuntia stenopetala, Sellaginella sp and Thelocactus leucacanthus.